The fate of Homeland Union – Lithuanian Christian Democrats (TS-LKD) leader Gabrielius Lansdbergis will be revealed in February through the party chairman election. Other than Landsbergis, Mykolas Majauskas, Paulius Saudargas and Žygimantas Pavilionis are running for the office, alfa.lt reports. Political scientists predict that the main challengers to the incumbent leader could be the two representatives of the Christian Democrat wing of the TS-LKD – Ž. Pavilionis or P. Saudargas. After the Seimas elections where the Conservatives won 31 mandates, some members of the party had complaints toward G. Landsbergis for the apparently lost elections. Later on with the TS-LKD failing to come to agreement with the “Peasants” on a coalition deal, criticism toward the party chairman rose. Thus in November last year G. Landsbergis announced he would like to initiate chairman elections as soon as possible. “G. Landsbergis’ chances are fairly high, though lately people tend to surprise and choose other alternatives than predicted,” Mykolas Romeris University lecturer, political scientist Rima Urbonaitė said. Though G. Landsbergis’ positions are strong, according to her he may fall to a lack of time and strong competition. “Truth be told both P. Saudargas and Ž. Pavilionis’ representation of the other bloc appears fairly strong currently. It cannot be said that G. Landsbergis has no competition. It exists. He managed to increase the competition through speaking of shortening the party’s name. (The party members’ – Alfa.lt) reactions were definitely not the best,” R. Urbonaitė noted. Vytautas Magnus University lecturer and political scientist Ingrida Unikaitė-Jakuntavičienė said that she sees Christian Democrat wing representative P. Saudargas as G. Landsbergis’ chief rival. Nevertheless, according to her everything will depend on how active the candidates are and their statements on certain questions. “Sometimes certain more controversial statements appear or ones that are not acceptable for everyone. As such sometimes by remaining silent and not stepping out of line it is possible to obtain more support,” the political scientist noted. Valuable support from V. Landsbergis? 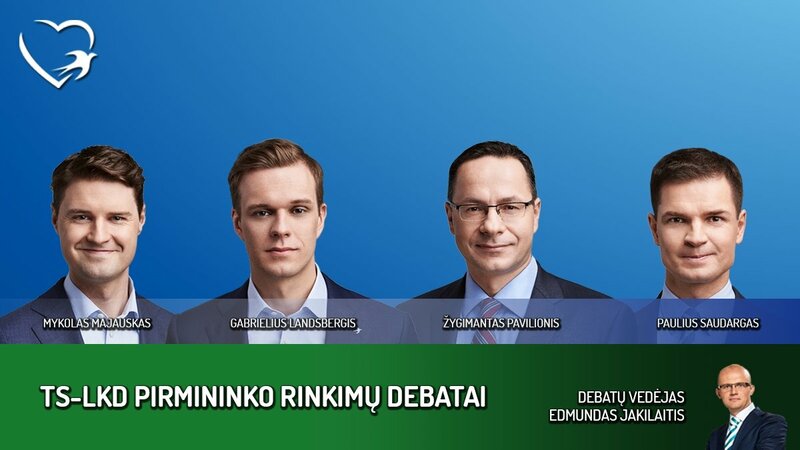 Vytautas Magnus University (VDU) professor Mindaugas Jurkynas believes that G. Landsbergis has the greatest odds of winning the election because the other candidates are simply too weak. “His time as chairman is still rather small and his credit of trust has yet to be spent during his short term. 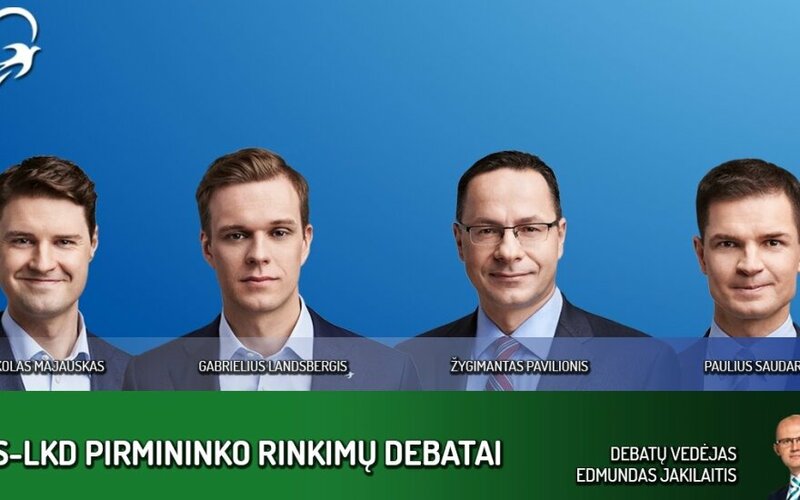 Him being the only to win in Kaunas where all other candidates lost shows that he is an attractive young leader who has a vision and the support of the party patriarch V. Landsbergis,” the professor said. He notes that G. Landsbergis can be an even more unifying figure than the representatives of the Christian Democrat wing who are more radical, with a more Christian vision. Meanwhile TS-LKD party patriarch Vytautas Landsbergis has released a letter to his community where he claims that his grandson G. Landsbergis is being attacked. According to him this is an attempt to remove G. Landsbergis from the party chairman elections. There are predictions that this time V. Landsbergis could be particularly active in his support because the old leaders of the TS-LKD have not provided any serious backing to any candidate. During the previous party leader election professor V. Landsbergis was fairly passive and more of an observer of the process. Nevertheless M. Jurkynas notes that V. Landsbergis has always consistently supported his grandson, this has not changed, his positions haven’t changed. “It is natural that V. Landsbergis’ voice is significant to conservative voters and should strengthen G. Landsbergis’ positions,” the VDU professor said. According to R. Urbonaitė lately there is a clear division visible in the TS-LKD. She notes that this split is deepened even more by G. Landsbergis by not hiding his liberal leanings, which raises internal discussions in the party. “In other terms this axis or party identity is hung in the air and they need to purify it to clarity because currently there is confusion and rising dissonance in the party. On one hand we see a variety of opinion, but this definitely does not create trust in the party as a unity. Voters may be presented with the imaged that this is a party of two parts, which is not fully correct,” she explains. The expert points out that currently the party is faced with numerous challenges which it can overcome only by cooperating and seeking results in mutual work. “It (the TS-LKD – Alfa.lt) is never the second choice. It is, let’s say pathologically hated by voters. In other terms either you vote for the TS-LKD or you never vote for them and even feel great antipathy. This is a great challenge and it would be worth thinking how to change it. The first round of elections in the single-mandate districts showed the Conservatives have serious problems,” explained R. Urbonaitė. This problem was admitted by P. Saudargas. During a debate at the Martynas Mažvydas National Library of Lithuania on Wednesday he said that during the second round of elections the party had to settle with a loss because the TS-LKD is not a second choice party. “The voters chose anyone but us. It is as if the electorates of all other parties united against our candidates. We have to resolve this problem, the not being a second choice party,” Saudargas said. R. Urbonaitė believes that these are all clear challenges which show that things are not going as per plan or intention. According to her primarily the party itself has to come to terms. “The party needs to change face presented to voters, a less arrogant one. While in part it is just a myth about the Conservatives, every myth has a grain of truth,” she concluded. Will Landsbergis hold on to the Conservative throne? Political parties' chairmanships crisis – who is next?